The easiest way to propagate columnar cacti (Cereus, Pachycereus, Cephalocereus etc) is by cuttings. Some cuttings are growing tips, while others are stem sections without growing tips. The same methods can be applied to both. When you receive your cutting, it may be freshly cut or it may have been been cut a while ago. If you don’t know how long it has been cut, then it is advisable to cure the ends by leaving your cutting lying on its side in a dry, shady (but well lit) place for 2 to 3 weeks at least. Do not place in fridge or freezer, or wrap in damp cloth or similar! Just place it where it will not be damaged and will not be exposed to sun or rain. Once the ends are cured they usually become quite hard and cave in a little. They may also start to flake some dry layers of tissue, and some bulging may start under the surface near the edges. Depending on the time of year and the position the cactus was placed in it may have already started putting out rootnodes by this time. It doesn’t matter where these are. If they are in the right place, they will be encouraged to keep growing in the next steps, but if they are not in the right place they will probably just dry off. This does no damage to the plant. There are many ways to root cacti, but all of them should follow a few simple rules. 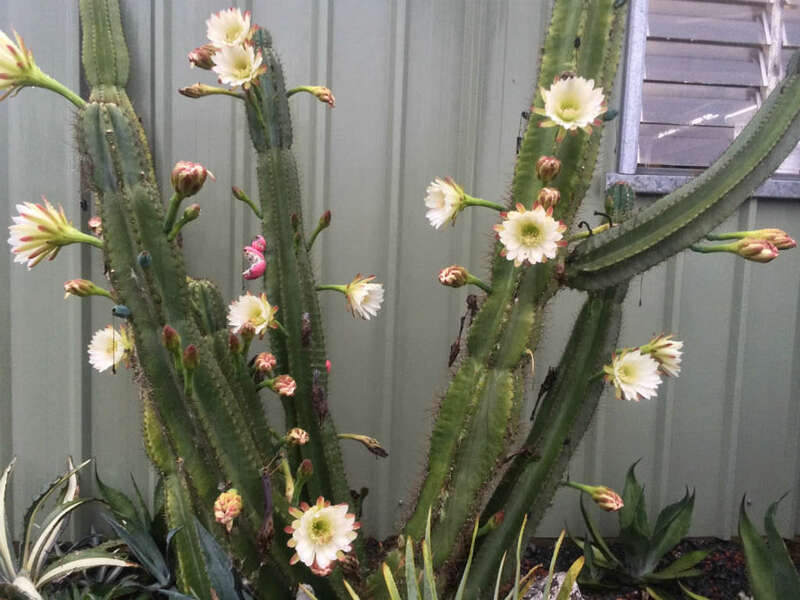 The medium must be suitable for growing cacti – commercial cactus mix, sand, perlite, light soil mixes are all good. The medium should be sterile for best results – heat on tray in oven at over 392°F (200°C) for 1 hour (perlite is already quite sterile and doesn’t need special treatment). Planting of the cutting is best done when they are actively growing (not in winter). Do not over-water. Cacti will almost never die from a lack of water (they store several months worth), but frequently from overwatering. The most professional method is too root your cutting in perlite. This has the added advantage, that the cutting can be placed onto the dry perlite bed as soon as it is cut and can undergo the drying process there. Once the ends are well cured, the cutting can be partly submerged into the perlite in the position desired. Whether you choose to place your cutting sideways or upright is a matter of choice. A tip cutting if placed sideways will bend upwards at the tip and may also produce side-shoots. The reason why side rooting is preferable is the fact that more root fibres develop and the plant receives more nutrients in a shorter period of development, which in turn increases the amount of new growth. The cutting and the surrounding perlite should then be watered. Once watering is started the tray or pot should be placed in a full sun position. The perlite should not contain any vermiculite (which is a popular hydroponic mixture) as this retains too much water and it should be watered every few days. The tray or pot containing the perlite should never sit in a puddle of water and should be entirely free draining. After a few weeks the cutting will have produced several roots and can be transplanted to a more nutritious medium, such as potting mix or cactus mix. To transfer the cutting, do not shake off the perlite. Transfer the whole rootball with as much perlite attached to it as possible. Place the new medium in the bottom of the pot and also around the rootball, with only a thin layer over the top. This will ensure that growth is not interrupted and reduces the risk of damaged roots being affected by diseases. After repotting do not water for 5 to 10 days and protect from rain. Again, this is to reduce the risk of diseases. Many of the columnar cacti respond well to fertilizing. Cacti should never be fertilized in winter.